The Open Door Christian Schools Athletic Department seeks to support the school's mission while promoting academic success, achieving athletic excellence, ensuring the highest principles of sports conduct, and fostering an appreciation for God's Word. The end goal is to develop men and women in intellectual maturity, wisdom, and Christian faith that are committed to serving the church, community, and world. Mr. Johnson is the Athletic Director at ODCS and began working here in July 2016. 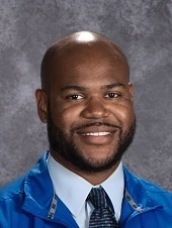 Mr. Johnson has a Bachelor's Degree in Communications from Webster University. He has been married to Brittany since 2012 and has two children. Mr. Johnson enjoys spending time with his family, coaching youth sports and watching sports at all levels. His favorite Bible verse is Philipians 4:13.